Make the Bible relevant to your life! How can a book that was written thousands of years ago help teens with the challenges they face every day? 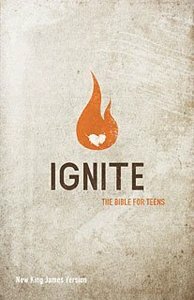 Ignite is an interactive Bible that will introduce today's teens to the Word of God in a fresh and unique way with features that introduce parts of the scriptures that are often overlooked or ignored. Ignite will deepen both understanding and devotion.